Most working Americans commute about 26 minutes each way to and from work. 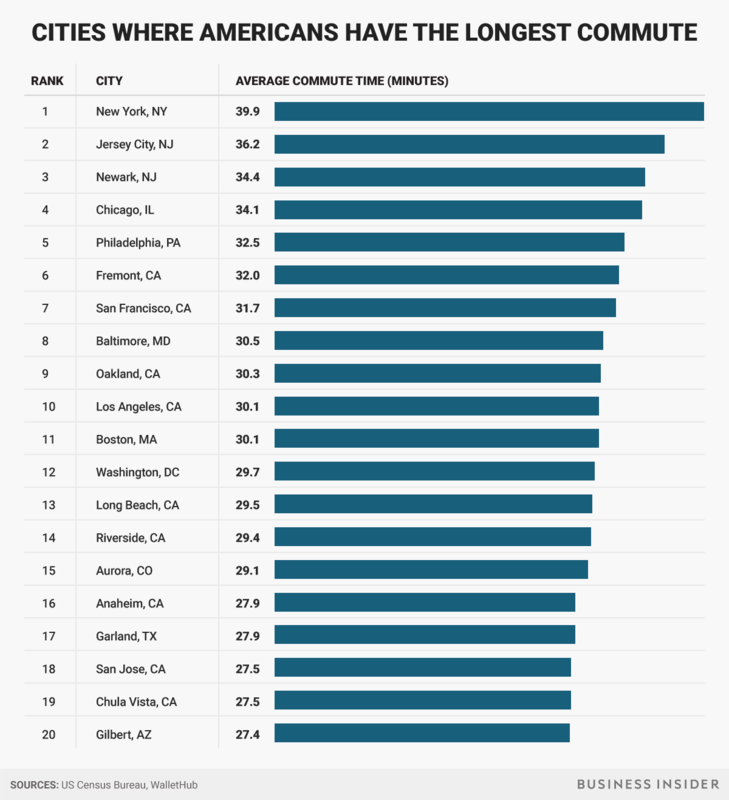 But when you live in one of these major US cities, you wind up spending more of your life commuting. The first thing you need to do is recognize what kind of person you are, says Connie Thanasoulis-Cerrachio, a career expert and cofounder of SixFigureStart. If you're energized in the morning and tired in the early evening, for example, use your trip to work to accomplish tasks and your trip home to relax and reenergize. While it's unlikely to make your commute shorter, starting or finishing the day with some physical activity can keep your brain sharp, in addition to keeping your body in shape, says Rita Friedman, a Philadelphia-based career coach. "Taking time each week during your commute to check in on your goals is a great way to stay on track and make adjustments," says Teri Hockett, chief executive of What's for Work? It's also the perfect time to think about what makes you happy and what areas of your life could be improved. If you're not driving or riding a bicycle, your morning commute is a great time to get a head start on your workday. Attending to messages early in the morning will set you up for a productive day. But experts say you shouldn't spend your entire commute doing work. These activities support your ongoing learning and development, Hockett says. If you'd like to get a head start on your day, you can use your commute time to get ready for what's on your calendar, Hoover says. "If you have a presentation, practice out loud and put the finishing touches on. If you have an important meeting, make sure you know what you're going to cover and your position on the subject matter." You can also use this time to plan the rest of your day outside the office. "Perhaps you can finalize the dinner menu in your mind, plan what you'll wear to an after-work function, or think about what you'll do with your kids this weekend. A workday without distractions relating to after-work responsibilities or activities can be far more productive," she says. Your commute is the perfect time to create a to-do list or fine-tune the one you've already made. "By creating a to-do list and prioritizing the day's responsibilities, you're setting yourself up to have a more organized and focused workday," Friedman says. If you can't actually write a list because you're driving, it can still be useful just to have a mental checklist. You might also consider using a voice recorder or memo app on your phone, just as long as it doesn't require you to look away from the road. Consider using your commute to unwind. "Practice calming your mind, or just enjoy the environment around you," Hockett says. "The idea is to just be present in the moment and relax." Friedman says you can, and should, spend some time thinking about what you did or need to do during the workday, "but if you spend a majority of your commute doing some deep breathing and focusing on the other things in your life, it can be an excellent transitional time so you don't walk in the door feeling wound up." Subscribe to a podcast or buy a language program. Your commute can be used to catch up on news, expand your knowledge in a particular area, or learn a new language. You may have limited time for this type of communication throughout the rest of the day, so use your commute time to call your parents, chat with your significant other, or text your friends — as long as you're not driving. If you're not driving, use your phone or tablet to interact with your network on social media by sharing information and engaging with them. Depending on your commute, you may be able to catch a power nap, which can give you a boost of energy, Hockett says. "Studies have shown that 10 to 15 minute naps can be very positive for the mind and body. Just set your alarm, and close your eyes." 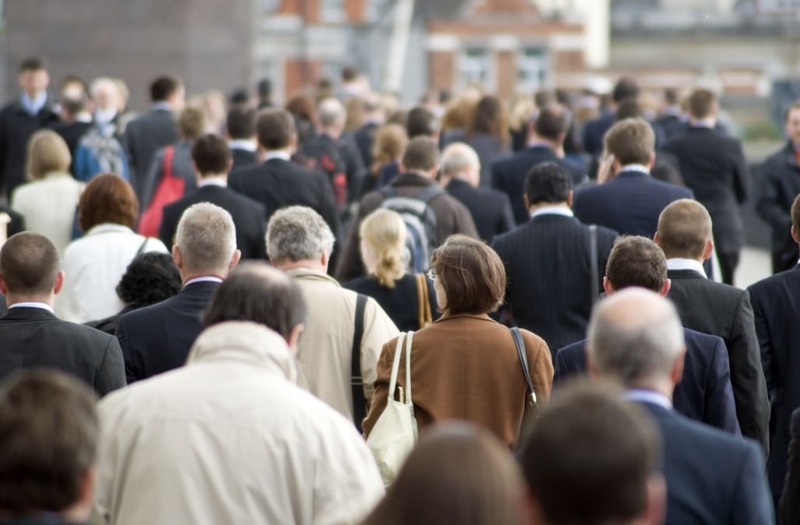 Using data collected from the US Census Bureau, personal-finance site WalletHub ranked 116 of the most populated cities based on the average number of minutes residents spend traveling from home to work. Using that same data, Business Insider also looked at how people commute to and from work in each city.